While other high school students are still struggling to figure out their goals in life, one young angler has already proven that he knows where his future is heading. The Rod Glove Pro Staff, Keegan Stroud is currently the youngest angler fishing in the BFL series and has proven himself on tournament trails. Keegan grew up in an outdoor loving family in Texas and his passion for fishing has found him fishing tournaments during his high school years as well as founding the fishing club at his school. With the help of a teacher, Stroud organized and has run the Fredericksburg High School fishing team, The Battlin' Bass. 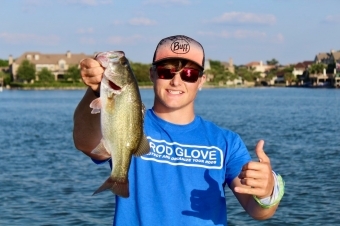 It is his ultimate goal to inspire other younger anglers to get into the sport of fishing. With his passion for competition and tournament bass fishing, Keegan is living the dream. Keegan doesn't limit his fishing to just one technique and said that "With new baits and product hitting the market everyday, new techniques are emerging, and I learn and experience more each day. I would have to say that my favorite technique specific pattern is targeting spawning bass in clear water." Although Keegan's passion lies in freshwater bass fishing, he recently got out for some peacock bass fishing and had a blast. He said that it is different from freshwater largemouth or smallmouth in the way they feed, where they are located and how the bite and fight. His immediate personal goals are to continue growing within the Professional and Collegiate BASS Tournament series, while attending the Savannah College of Art and Design beginning in the fall of 2018. In the meantime, he will continue his senior year and fish as much as he can between his studies.